JTS Vacations is a travel design firm focused on offering customized high-quality and unforgettable experiences – from the moment you set up a consultation all the way to when you come back home, feeling fulfilled and satisfied from a gorgeous and picture-perfect trip. I specialize in all-inclusive Caribbean vacations, international getaways and group travel opportunities. My goal is to ensure that all details are accounted for. I know and understand how precious your vacation time is, you’ve worked hard and have been looking forward to pampering, some TLC, and exquisite experiences. You deserve the best the world has to offer, and my mission is to ensure that those desires are met! 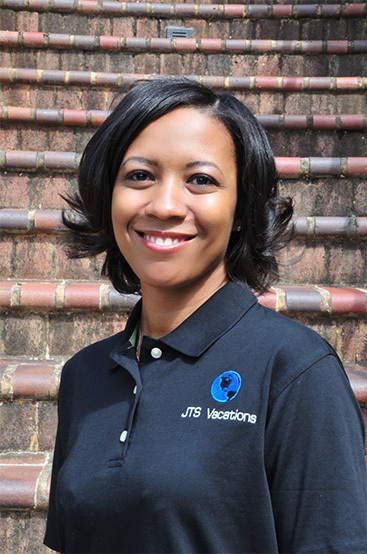 Shamica Davis is a passionate and experienced travel planner. She has been providing first-class travel planning services since 2014 and strives to find the best offers while maintaining the highest of standards and fulfilling the demands of her clients. With an array of Travel Certifications, Shamica will go above and beyond to ensure that your travel experience is unique and unforgettable. She has the resources and the network to provide you with 4 & 5-star accommodations, comfortable flights, and world-class itineraries. Plan your next vacation with Shamica today! More about my specialties and affiliations.